The University Library Greifswald provides a central learning and work environment for the University´s students and researchers. It is made up of the Central University Library, the Old University Library, the Departmental Library, the Library Archive Am Schießwall and other facilities at external locations. The University Library is not only home to 2.2 million books, but also gives its users access to databases and other electronic media. The University Library provides visitors with the total of 775 workstations at its various facilities. 626 of these are study desks equipped with access to the University´s computer network. 80 research stations with PCs make it possible to perform searches in OPAC, retrieve further subject information and carry out other online searches. Service desks help users with enquiries, but also with lending and returning the media. The Central University Library´s vast entrance hall provides space for changing exhibitions. The University Library offers regular tours and general courses on how to use the library and databases. The Old University Library, Rubenowstraße 4, offers you access to special collections. The collections of the Old University Library comprise literature published prior to 1850 that is worth preserving, including parts of the Pomeranian literature Pomeranica and the manuscripts. ... The Central University Library covers the area of two football pitches (13,890 m2). ... The various resources cover more than half of the area (8,651 m2). ... 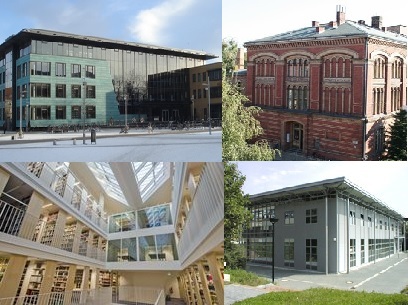 If you put all the books in the Central University Library next to each other, it would cover the distance between Greifswald and Stralsund (approx. 33 km). 10 km are on display on the open shelves. Further 23 km are kept in the closed stacks and can be ordered within 24 h.
... Nearly every 11th registered student at the University Library has his/her "own" workstation at one of the University Library´s facilities. ... Members of the University can use the internet for research purposes at 100 PCs. Lots of the workstations are equipped with a network access for the user´s own laptop. ... 7 group carrels for 2-10 persons can be used by revision groups, project teams and for other group work. Plese reserve well in advance! ... There are 36 individual carrels for those who rather have a "quiet space" to themselves. ... The University Library´s facilites are accessible to users 110 hours per week and on 340 days of the year. The Central University Library´s trained staff can be contacted at the service desk and by telephone on 73 hours of the week. Are you missing a book in the University Library´s collection? Would you like a particular book to be digitised? All of the facilities offer services for disabled users. The Central University Library and the Departmental Library provide disabled access.